We pride ourselves in being super competent hosts, born and raised in the mountainous region, the terrain and weather here holding no secrets to us, and we really love our mountain life and are only too happy to share with you info on the most beautiful nooks and crannies of the valley. A holiday organized by mountain bikers for mountain bikers, which guaratees the ideal mix between nice biking days and relaxing holiday. Wolly was one of the first mountain bike guides in the Dolomites and hast o show lots of experience in guiding bikers on the most interesting tours of this wonderful area. He is a qualified “Bike Guide Südtirol”, Enduro-Guide and E-bike Guide. 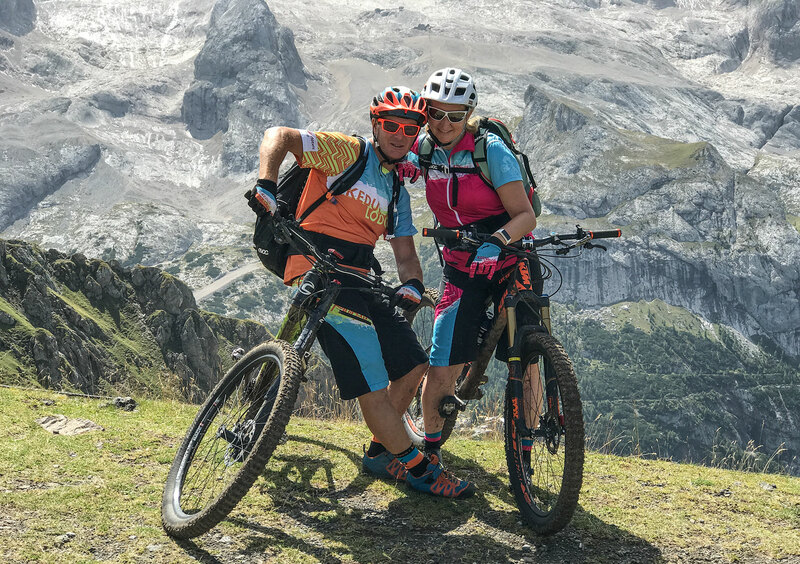 Every day guided mountain bike tours, a relaxed and an informal atmosphere and the total bike-competence of a „Bike Hotel Südtirol“: what more does a biker need? Our house is on the sunny side of S. Cristina, directly on the promenade which connects the three villages of the Val Gardena, Selva, S. Cristina and Ortisei, with each other. The house is in a calm area but only 2 minutes on foot from the center of S. Cristina, which means from the choice of restaurants, bars and shops and the right starting spot for every mountain bike and hiking tour. In Winter our Kedul-Shuttle drives you directly to the Saslong Cablecar, where you have direct access to the Sellaronda and GardenaRonda. Wellness means for us, sitting in our garden with breathtaking view on the Saslong mountain, drinking a refreshing drink and talking about the Dolomites mountain bike adventures of the day. There is no better place to hike, climb or realx than the the Dolomites, UNESCO World Heritage. 500 km perfektly prepared slopes and the most modern lifts: this is what the skiing area Val Gardena/Alpe di Siusi and the Sellaronda guarantee… and of course many other activities to experience during the Val Gardena wintertime. The cost-benefit-ratio has to be right and we are sure it is in our case. Find out more about our offers for your unforgettable holiday in Val Gardena and contact us for your personal offer.